Interview question ‘ How do you handle conflict ‘ is very open ended question basically. The workplace is filled with various forms of conflict and so the employer wants to dig in whether you are capable of handling all that. It is a purposeful query where the potential employer wants an unrestricted explanation from you about how well you tackle diverse conflicts that you will stumble upon at work. Thus, before an interview, you need to be prepared by putting in some thoughts every time you have confronted conflicts and dealt with it well. Presenting examples are imperative. Employ these tips as you set up the best interview answer that is persuasive. It is alright if you ask the interviewer for specification related to the question of conflict. Ask whether the employer wants to know regarding work associated conflicts or conflicts with fellow employees. The employer will tell you what he intends to know or he will let you choose. After employer narrows down the query, you can answer accordingly and keep in mind it is a behavioral interview inquiry. Firstly you need to explain the situation in which you faced conflict; it may be a task. Demonstrate the actions that you exercised to settle that conflict. Then give a decent account on what it resulted into, whether it had positive or negative consequences. The question cannot be answered as “yes I can tackle conflicts”. This query requires examples to convince the employer. Remember to provide situations where you resolved conflict situation and not just hand over a brief and generic answer. When you choose an instance for the employers, make sure the situation you are putting forward should display that you had taken an active approach in handling conflict resolution methods. The conflict should be a significant one. Minor disagreements, conflicts that got to the bottom by someone else or conflicts that dissolved without any actions should not be presented. Do not share an incident that can make you look bad, like situations where the conflict was caused by your miscommunication or blunder. The idea behind this inquiry is to comprehend your problem solving capabilities and interpersonal competence. You need to specify your actions right away. Do not keep talking about irrelevant points but get straight with your contribution in the dealing with conflict. Do not memorize a script however stick to points such as situation, action and the result. Focus on your capabilities rather wandering off not clearing your point to the employers. Such behavioural inquiry questions need to be prepared beforehand. Practice your conflict story as you need to deliver it with confidence. The conflict stories generally comprise of situations like arguments damaged professional relationships and such problems. Thus you need to appear confident while discussing this sensitive information in a manner that will get your point clear across the employers. Let the employers know that you will follow the company’s policy to solving conflicts. Tell that you aim to follow the protocols that are laid by the organization with its human resource department. Say you will apply company’s best guiding principles to get to the bottom of conflicts. Show interest in learning the company’s policies. Regardless of the kind of conflicts, a crucial secret to triumphant resolution is enduring with calm. Operating to disperse conflict and get a hold of an unbiased solution to the concern at hand. Emphasize your skills to behave judiciously, not to let issues intensify but to attempt to function with and not against, the person or condition originating the conflict. Employers know that conflicts are inevitable in the workplace. During the interview you should make it comprehensible that you, in any circumstances, consider conflicts with respect plus professionalism. Tell them how you respect your profession and the people at workplace that you try to steer clear of any such conflicts. A conflict that involves an employee and client will result in a loss of business. Thus you need to state that when such workplace conflict arise you act professional whilst representing the whole organization. And that you will strive to solve it by tackling the customer or clients complaints in a suitable and fair method. State that when times of conflict occur you spend quality time in contemplating the situation. Answer that you scrutinize the facts over rumors and then pick up a decision for resolution. Let the employer know that you take into hands the minor differences and tensions so as to not let it turn into a major conflict leading to controversies. State that it is easier to handle it when disputes are small and manageable and get diminished quickly. It is not good to ignore issues and think that they will resolve with time. Along with examples add that when having conflict in the workplace with superiors you try to understand their perspectives. As an employee there are many times you may disagree with your superiors and so it is important to let the employers know that you understand the various viewpoints that exist at a workplace and respect the differences. In a work environment, you will operate along with other people and you may come across conflicts that are amongst others at the workplace. In your answer it is favorable to add a situation where you resolved a clash between other two individuals at work as a third party. Mention a successful settlement amongst them that shows how competent you are functioning with other people. While sharing the previous experience of managing conflict in the workplace, ensure that you do not speak negatively about your previous company, work or colleagues. It is not a favorable way to present issues as it will portray that you will take and consider prospective work conflicts negatively and speak ill which is not professional. State everything as matter of fact and in a positive manner. Keep numerous instances ready. If probable, utilize one that links to the work you would be performing for the potential company. For example, in case the job is customer oriented, pick an occasion of dealing with a customer. In case you would be organizing and managing people, share an event of managing conflict at work with somebody on your team. Demonstrate a case where you had to control your emotions like anger, frustration etc. Share a detail about how you handled work or personal conflict at work by controlling your emotions and acting opposite to what actually you felt. Like in case of anger, you took some time calmed yourself and then resolved the dispute. Let the employers know that you communicate to clear your doubts, understand varied perspectives and avoid misunderstanding. The biggest culprit is miscommunication that often leads to conflicts and that you try your best to stay out of miscommunication to diffuse conflicts. As an employee of a company you need to work in a team and so everyone’s agreements and satisfaction will be important. In your response you need to ensure the employers that the decisions you make on conflicting issues will not be a biased one. Either you will act as a mediator or call upon one to settle the disputes and come to a unanimous decision. Let know the employers that you believe in observing things before judging. This way you will be perceived as someone who does not assume blindly and believe in false rumors. With the help of illustrations of past experience tell the employers that you take considerable time in observing and contemplating the issues before taking significant decisions. Tell the employers how you would appreciate if the conflict with someone or during work has ended and will let know how good you feel about it being settled. Demonstrate how you will express your gratitude to others so that the relationship at workplace remains stable and in good terms. It is a difficult thing for people to do however show confidence in your answer to the employers that you really look forward to a healthy work environment. Convince the employers that when you solve problems you make the other person know of what objectives you aim for after resolving conflict in the workplace and ask concerning their motives. Then state that you come up with a mutual benefit that can even settle conflicts. This will be recognized as a good strategy in you. Tell the employers that after few experiences with conflicts, you are now well aware how to identify issues that can turn out to be a situation of heavy disagreements and disputes. If you do not have the experience you can give personal experiences that are relevant to the work you will be performing and affirm that you can clearly spot conflicts early. Inform the employees that you believe in requesting people in times of conflict. There are chances people react in anger and elevate the conflict into a whole aggravated argument. Thus knowing that you can handle conflicts in the workplace by still urging people to straighten out the issue is an ideal best employee. It is very essential for anyone to highlight conflict resolution skills, problem-solving skills, communication skills and emotional intelligence as these are the desirable traits that employers seek. 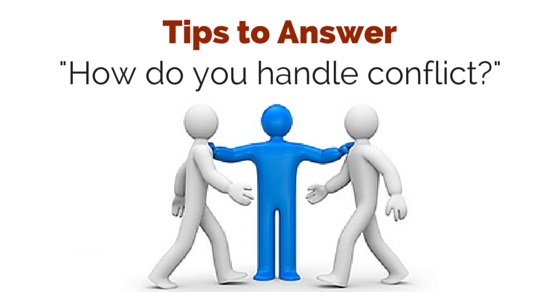 ‘ how do you handle conflict ‘ question basically demands to know your competence in coping with the numerous kinds of controversies that will arise at a workplace. You need to show a casual and self-assured attitude towards this query to display that conflicts are bound to happen and so you are well equipped and ready to take actions. Next articleHow to Make yourself Look Good in a Job Interview?